Members of the Central American caravan head to the border on Sunday causing a shut down of cross-border travel between San Diego and Tijuana. Photo by Adriana Heldiz, Voice of San Diego. GUEST BLOG / Pool Reporting from San Diego based VOICE OF SAN DIEGO--The San Ysidro Port of Entry is one of the busiest border crossings in the world — especially so on the Sunday after a holiday weekend. But U.S. Customs and Border Protection officials shut it down in both directions Sunday after a group of migrants rushed toward the border. The Border Patrol reported that a breakaway group from a demonstration went through vehicle lanes, where they were turned back. Elsewhere, the Tijuana River crosses the border in a notorious concrete canal. Our Adriana Heldiz captured video of the moment many demonstrators ran across the canal and then toward the fencing on the U.S. side and PedWest. That was when officials shut down the border. One report cited an unnamed Mexican official who said 30 people breached the border. Mexico pledged to deport them. U.S. law enforcement — provoked, officials said, by people throwing projectiles — fired tear gas over the border and into the crowd. That move got the world’s attention and produced some stunning images, including an instantly iconic picture of a woman running from the tear gas with two small children. U.S. Rep. Juan Vargas, who represents the area, slammed President Trump in a prepared statement. While attention on the migrant caravan that made its way from Honduras had waned, Sunday’s events brought a vast humanitarian crisis developing in Tijuana to the world’s attention. And it was the stuff of nightmares for business leaders and border politicians who have worked for years to keep the cross-border economy healthy amid compounding threats. For several hours, Interstate 5 and roads all around the border crossing were eerily empty but for law enforcement. By 5 p.m., both pedestrian and vehicle lanes were open again. Tijuana’s crisis: Days earlier, Mayor Juan Manuel Gastélum had declared a humanitarian crisis and asked the United Nations for aid as approximately 5,000 Central American migrants seeking asylum arrived and thousands more were expected. KPBS reports that many mothers within the caravan are worried that the unruly men in their midst are hurting everyone’s chances for asylum in the United States. 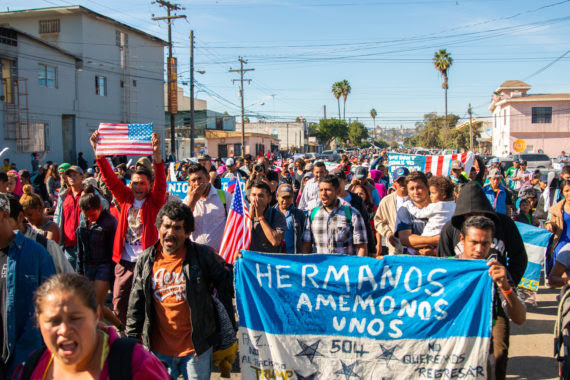 According to the U-T, more than 100 Central Americans had been detained, most for non-violent crimes involving drug possession, being drunk in public or disturbing the peace. Meanwhile, health conditions appear to be worsening inside one large camp. The U-T reports that the government of Baja California by Friday had treated 818 respiratory infections and conducted 1,286 general medical consultations.